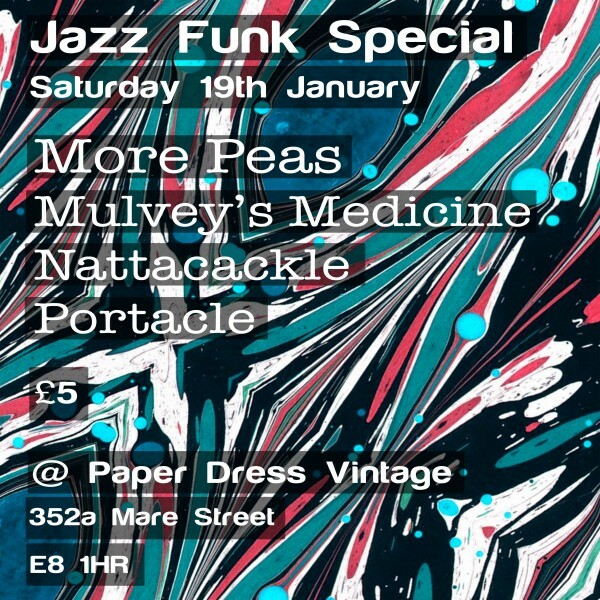 Jazz Funk Special ft. More Peas / Mulvey’s Medicine / Nattacackle + more..
Jazz Funk extravangaza topped by Funky saxy 6-piece More Peas backed up by Jazz Funk sextet Mulvey’s Medicine & Jazz Fusion heads Portacle & Nattacackle plus DJ Karl Bos (Deeper Cuts) spinning soulful dance music till 3am! Funky punky saxy six-piece. Bass, beats, singing, dancing, feminism, audience participation, unitards. London via Chile, Spain, Malta, Manchester and other exotic places. Inspiration c/o ESG, Slits, Parliament-Funkadelic, Betty Davis, Riot Grrrl, Latin, Jazz, Hip Hop, Pop, Afrobeat, whatever. Mulvey’s Medicine are a Jazz/Funk sextet from London. Composed and arranged by Eddie Mulvey. Perfected by The Medicine. Produced by Jorge Arango Kure.